A black and white photograph of the Huntley Family taken outside on Sunday, September 14, 1947. Front row from left to right: Pete Sandford, Ron Huntley, George Huntley, Florence Huntley, Doug Wiles and Fred Skinner. Second row from left to right: Joan (Heydon) Huntley, Verna (Huntley) Sandford, Marjorie (Grice) Huntley, Margaret (Mann) Huntley, Gladys (Huntley) Wiles and Erma (Huntley) Skinner. 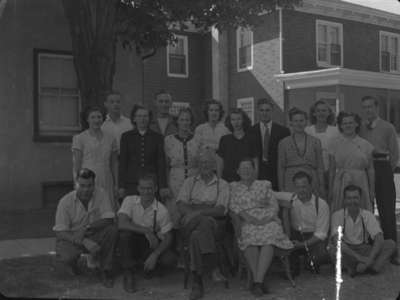 Back row from left to right: Harold Huntley, Eugene Huntley, Joan Huntley, Earl Huntley, Jean (Huntley) Handscomb, Bruce Handscomb. Huntley Family Portrait, September 14, 1947, Marjorie Ruddy. Whitby Archives A2013_040_1077.